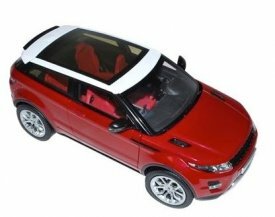 This very detailed die-cast Evoque replica is not a toy and is not suitable for children under 14. The model is 245mm long x 120mm wide x 95mm high. It has detailed engine and interior parts with opening doors, boot and has a button under the chassis to open the bonnet, even the side mirrors fold on this superb scaled replica which is a must for all collectors and enthusiasts.